Why not make your pie or cheesecake with three crusts, with this idea from Reynolds Kitchns? Can’t decide which type of crust you want on your pie or cheesecake? Use two or three different crusts! 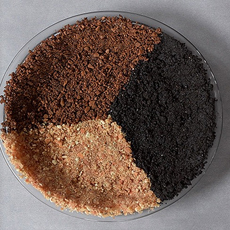 This idea is from Reynolds Kitchens, which used gingersnap, chocolate wafer and vanilla wafer crumbs in one crust: something for everyone. Whenever you have a recipe with a cookie crust, try it with your own two or three favorite cookie types. We did, and decided we like chocolate cookie crust with a plain cheesecake (and even with a fruit topping), and gingersnap crust with a pumpkin cheesecake. Don’t you just love food fun?